KipRich demolished Sumfest's Jagra Dancehall Night and there's no doubt about it. After his performance, some fans could be heard shouting while others agreed: "Di man bad! Di man bad! Jah now star!" But first, here's a quick rewind. 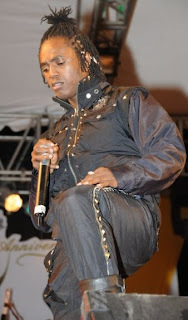 Dancehall artiste KipRich who is known for his quick wit and tremendous appeal with female fans, emerged on the Sumfest stage early this morning to the beat of Michael Jackson's Beat It. Immediately fans knew they were in for a treat at the show, which was dedicated to Jackson this year. Then there he was, ready to go, in the first viewing from his upcoming "Nuh Behaviour" fashion line, which (for the night) was inspired by the late great pop icon's unmistakable style. For the first time fans got the opportunity to see KipRich's two creative sides fused on one stage -- his dangerous performing talent and his impressive eye for fashion detail. He rode the 'Unfinished Business riddim' with incredible flair and had the crowd going wild; he quickly went on to a number of songs on the 'Self Defense riddim'; then a comical remake of the soft-rock hit, Apologize. Then there it was! Michael Jackson's Heal The World. The crowd screamed uncontrollably not only in cheers but also sang along to Jackson's hit. But KipRich had something more up his tricky sleeve. He paused to call a Caucasian female visiting from the Virgin Islands on stage. People paused to wonder why. "If yuh come from Virgin Islands, yuh mus be a virgin den, so do di virgin dance!" he demanded. And dance she did! The massive crowd again roared with excitement. Soon after KipRich went into a slew of old and new songs and closed his set with patrons wanting more. This, they will be able to get on Sunday night's "Fully Loaded" at James Bond Beach, St. Mary. KipRich said, "Yeah man, I'm happy people liked the performance. At some points I couldn't even hear myself because of the cheering," he laughed, "and then people loved the outfit too, so mi jus give thanks. But I don't want people to think is a Michael Jackson clothing line mi have you nuh, it's not. It's just for tonight for the Sumfest theme and to show dem why mi say 'Nuh Behaviour'. When we say that, what we mean is dat we go all out wid the drama every time. But the line if full of great things, not to mention the jewelry." The launch of the 'Nuh Behaviour' fashion line "Nuh Behaviour: A Life of Rebellious Style", happens the final week in August at the Pepsi Playas Club at UWI, Mona, St. Andrew.